Before I began making my Easter candy this year, I received a generous gift of assorted chocolates from a friend who works for The Hershey Company. I wanted to incorporate this gift into my Easter candy-making ritual, so I put a few of the rolled “insides” aside and refrigerated them for later use. The original undertaking left me candied-out, so I let them sit for quite a few days. Ultimately, I decided to dip the remaining eggs in unsweetened chocolate, wondering how the sweet fillings would blend with a bitter chocolate coating. To my delight, this truly bitter-sweet pairing was amazingly delicious. While traditional at Easter time, these candies are a hit any time, and can be rolled into balls for a different presentation. 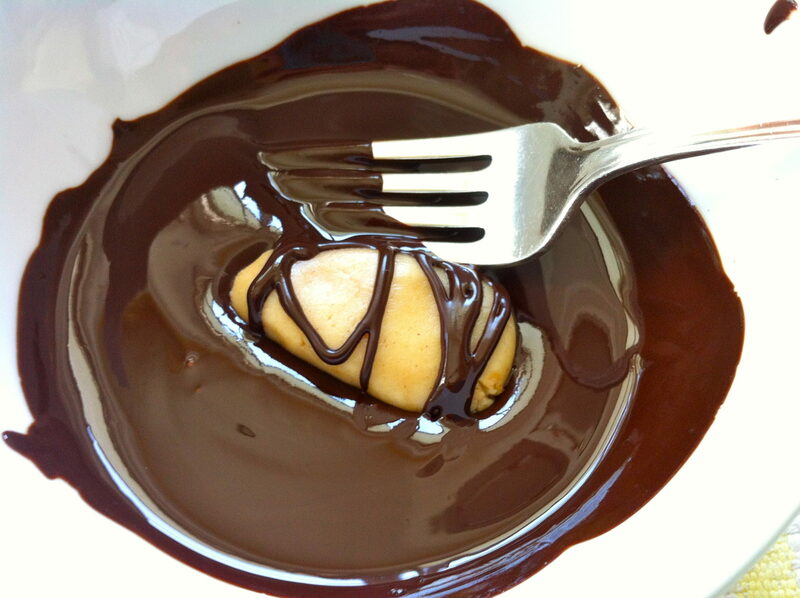 You may click on this link for the original Chocolate Peanut Butter Egg recipe in its entirety. This concept works beautifully with my Coconut Cream Egg recipe, too. If you make either of these recipes, consider dipping a portion of the eggs in unsweetened chocolate for this tasty, nuanced twist!